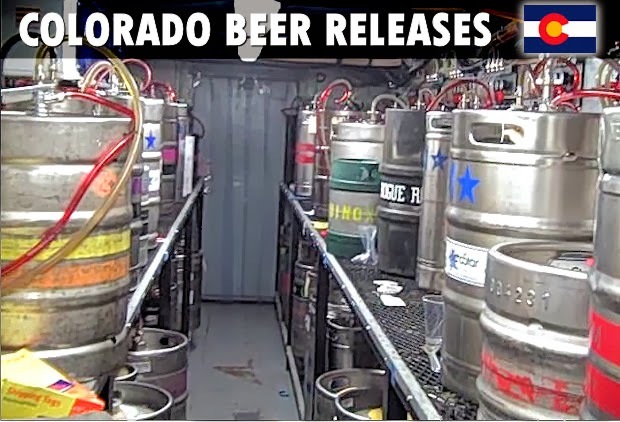 Here are some of the known Colorado craft beers released during this past week. While this list isn't complete by any means, it does represents a big chunk of the 200+ breweries here in Colorado. Fall and Winter seasonals and darker beers are common these days. Winter warmers, Porters, Stouts, Barleywines, Hard ciders and more. If you spot something interesting - head on over to that brewery before it's gone. Please note that some of these releases are firkins or specialty kegs and may already be gone. Big Beaver Brewing - Commando Under the Kilt - Scottish Ale - January 11th 7pm. Black Bottle Brewing - Mosaic Hipster - IPA w/only Mosaic hops - January 8th. Black Sky Brewery - Demonseed IPA - January 7th. Blue Moon Brewing - Valencia Grove Amber - seasonal - January 10th. Bonfire Brewing - Imperial Stout - January 9th @ Vale Ale House. Bonfire Brewing - Strong Scotch Sour - January 9th @ Vale Ale House. Bonfire Brewing - Pomegranate Sour - January 9th @ Vale Ale House. Bonfire Brewing - Strong Scotch Ale - January 9th @ Vale Ale House. Breckenridge Brew Pub - Twenty Four - Belgian Double Oatmeal Stout - January 8th. Broken Plow Brewery - Chili Beer - January 9th. Butcherknife Brewing - Imperial IPA - January 11th @ Big Beers in Vail. Cannonball Creek - Oatmeal Brown Ale - session beer 4.5% ABV - January 8th. Coopersmith's - Sir Edmund's Extra Special Bitter - ESB - January 6th. Copper Kettle Brewing - Holy Basil IPL - cask - January 8th 3pm. Crabtree Brewing - Old William - scottish ale - firkin - January 7th 4pm. Crazy Mountain Brewing - Neomexicanus Native Pale Ale - January 10th. Dad & Dude's Breweria - Sweet Sassy Molassy Brown Ale - January 10th. Denver Beer Co - Cocoa-creme Graham Cracker Porter - 2nd week of January. Diebolt Brewing - Inde Pale Biere #1 - w/Saison yeast - January 10th. Diebolt Brewing - Inde Pale Biere #2 - w/Trappist yeast - January 10th. Dillon Dam Brewery - Winter Warmer - English Wassail Brown - around Jan. 10th. Dry Dock Brewing - Amarillo Dry-hopped IPA - firkin - January 10th 3pm. Echo Brewing - Powder Run Pale - Pale Ale - January 8th. Equinox Brewing - Space Ghost IPA - returns January 7th. Epic Brewing - Old Sage Brett - barrel aged Saison - 2 kegs only - Jan. 9th. Fate Brewing - Baltic Porter - 7.4% ABV - January 6th. Front Range Brewing - Double IPA - January 7th. Golden City Brewery - Imperial Pumpkin - January 12th. Grimm Brothers Brewhouse - Seven Ravens - Schwarzbier - draft only - January 10th. Grist Brewing Co - Morocha Hoppy Stout - 83 IBU stout - January 8th 4pm. High Hops Brewery - Strawbanero Honey - firkin - January 8th 5pm. Jagged Mountain - Vallecito - Belgian Dark Strong Ale 11% ABV - January 10th. Kannah Creek Brewing - Ruby Red Blonde - firkin - January 6th. Kokopelli Beer Co - Pale Ale - American Pale 5.3% ABV - January 10th Grand Opening! Kokopelli Beer Co - Copper Road Ale - ESB 5.5% ABV - Jan. 10th. Kokopelli Beer Co - White Belgian - Belgian style white 4.9% ABV - January 10th. Kokopelli Beer Co - Autumns Amber - American Amber 5.9% ABV - January 10th. Kokopelli Beer Co - India Pale Ale - IPA 6.8% ABV - January 10th. Kokopelli Beer Co - Milk Stout - a sweet stout 5.5% ABV - January 10th. Lone Tree Brewing - Bronco Belgian Pale - January 8th. Mountain Toad - Oatmeal Stout - tadpole tap - January 9th. Odell Brewing - Wood Tusk - Oak Aged IPA - pilot brew - January 9th. Odell Brewing - Nasiatka Kopoba - Imperial Milk Stout - January 9th. Odell Brewing - Exp #2 - Experimental Hop Pale Ale - January 9th. Odell Brewing - Wolf Picker - Experimental hop pale ale - bottles - January 11th. Pateros Creek - Rattlesnake Jack Mountain Ale - blackberry, chipotle, peanuts - Jan. 8th. River North Brewery - American-style Avarice - imperial stout small batch - January 8th 3pm. River North Brewery - Hello, Darkness - Black IPA - new batch January 8th. Rockyard Brewing - Redwood - redwood aged braggot - firkin - January 10th 4pm. Rockyard Brewing - Bourbon Barrel Stout - bottle release - January 10th. Station 26 Brewing - Coffee Red IPA - firkin - January 9th 4pm. Stem Ciders - Malice - dry-fermented stainless steel aged - January 10th Grand Opening. Stem Ciders - Banjo - bourbon barrel-aged cider - January 10th Grand Opening. Stem Ciders - Le Chêne - zinfandel barrel-aged cider - January 10th Grand Opening. The Post Brewing Co / Odd13 - Jake-ules British Mild Dark Ale - January 9th - Grand Opening. Trinity Brewing - Bourbon Barrel Aged Chilly Water - Baltic porter - January 10th 5pm. Twisted Pine - Be-Dank-a-Dank IPA - specialty - January 6th. Twisted Pine - King Leopold's IPA - Belgian-style IPA - January 6th. Twisted Pine - Rhesus Peanut Butter Stout - January 6th. Upslope Brewing - Chili Stout - firkin - January 10th (Lee Hill location). Verboten Brewing - Gluten Removed Killer Boots - caramel porter - January 7th. Verboten Brewing - Chicory Midnight Expresso - January 7th. West Flanders - Sub-Conscious Coffee Stout - 1 keg only - January 9th 5pm. Westminster Brewing - Imperial Stout - reg and cask conditioned - January 12th. Wynkoop Brewing - Mile High Mix - variety 12-pack release - January 8th. - Colorado Beer Releases Dec. 30 - January 5, 2014. - Colorado Beer Releases December 23-29, 2013. - Colorado Beer Releases December 16-22, 2013.